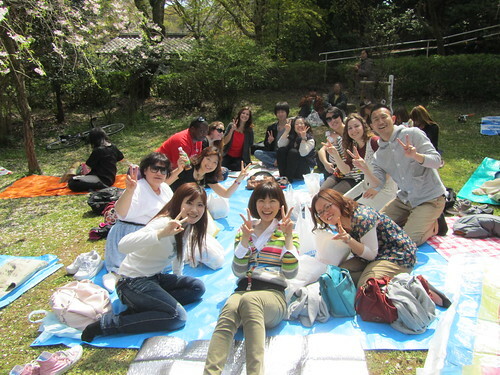 Spend any decent amount of time in Japan and you will soon discover that almost everyone, young and old, makes a V-sign with their fingers when posing for photos. In fact, after three years in Japan, I find I now have to consciously lower my hand when it’s time to say cheese, as it tends to shoot up automatically at the sight of a camera. The palm-outwards V sign is very commonly made by Japanese people, especially younger people, when posing for informal photographs. One account of this practice claims that during the 1972 Winter Olympics in Sapporo, Hokkaidō, American figure skater Janet Lynn stumbled into Japanese pop culture when she fell during a free-skate period, but continued to smile even as she sat on the ice. Though she placed only third in the competition, her cheerful diligence and indefatigability resonated with many Japanese viewers, making her an overnight foreign celebrity in Japan. 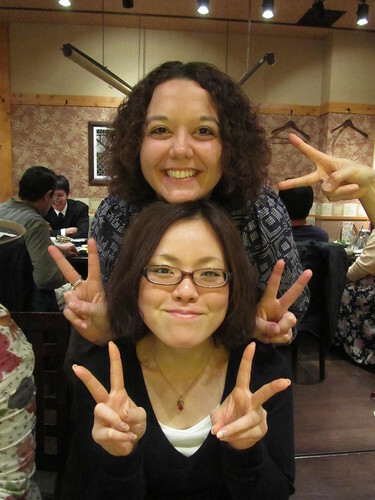 Lynn, a peace activist, was repeatedly seen flashing the V sign in the Japanese media thereafter. Though the V sign was known of in Japan before Lynn used it there (from the post-World War II Allied occupation of Japan), she is credited by some Japanese for having popularized its use in amateur photographs. According to another theory, the V sign was popularized by the actor and singer Jun Inoue, who showed it in a Konica camera commercial in 1972. 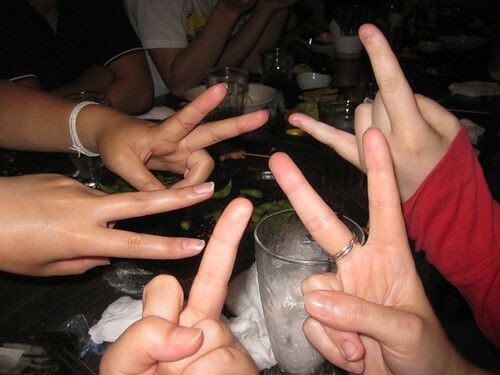 If you want to know more about the V-sign in other cultures, have a look at the Wiki page. It seems like a pretty universal sign of peace now, although I did have to explain to a few students in Japan that the “reverse peace sign” wasn’t a very peaceful gesture over here in England! I like it because it gives me something to do with my hands! It can get a bit cheesy though, so I love it when people expand into other hand gestures. The last picture is hilarious!